Favor tags and seating charts and chuppahs, oh my! Jen's mom is getting married this Saturday and things are quite hectic around here what with getting all the little details together. The details and pictures from that wedding will be coming soon and we're hoping to feature more real weddings in the next few months. 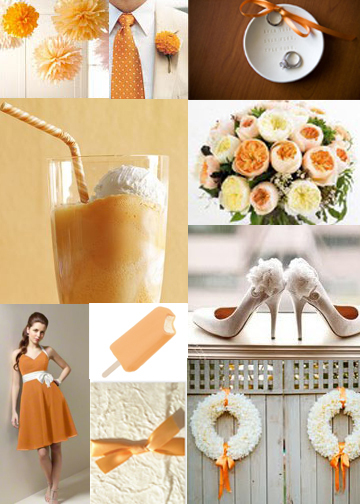 But, until then, here is a sweet and simple color board based on a favorite summer treat, the creamsicle. Pale orange and creamy white lend themselves nicely to a board that is inspired by hot days of summer spent by the pool, eagerly awaiting that familiar tune of the ice cream trunk as it rounds the corner.